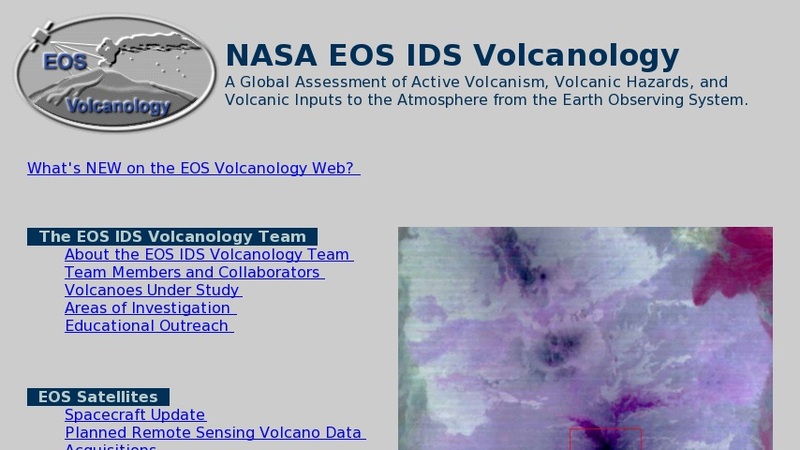 The National Aeronautics and Space Administration's (NASA) Earth Observing System Interdisciplinary Science Volcanology team provides assessments of active volcanism, volcanic hazards, and volcanic inputs to the atmosphere. This page provides information about their current research activities. Information is provided on the following volcanoes: Fernandina in the Galapagos Islands, Kilauea in Hawaii, Mount Pinatubo in the Philippines and Piton de la Fournaise on Reunion Island. An introduction to each volcano is provided, as well as photos and satellite images of eruptions, geology and geography, and various types of lava flows. Also included are the individual areas of study. These include eruption cloud dynamics, atmospheric emissions, thermal measurements, topographic measurements, volcanic hazards, distribution of rock units, geologic mapping, and surface volcanism.